Learn about Taos, New Mexico, by reading Taos, New Mexico—Where History and Fun Meet by Charlie Spence, Aviation Writer. It features a mini, but thorough tour of the destination, plus all you'll need to know to plan your trip including getting there, objective information on places to stay and eat, and things to do. At the end of the article, we've provided a summary of the contact information for your easy reference. Enjoy! There is a place where you can explore 1,000 years of history while enjoying a summer vacation with the most modern surroundings, or while taking respites from skiing on some of the most feather-like powder you won’t find elsewhere. Taos, New Mexico, is a place for all seasons. High in the Sangre de Cristo Mountains, Taos combines natural beauty and fascinating history with modern resorts and exciting adventures. It has more than 300 days of sun a year, and the high altitude makes for cool summers and fine winter sports snow. In 1540, Conquistador Hernando de Alvarado believed he had found the famed City of Gold, but it was the sun shining on the straw in the adobes of Taos Pueblo. 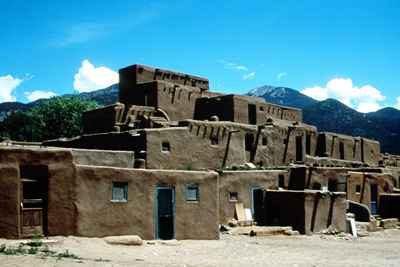 Taos Pueblo has been continuously inhabited for more than 1,000 years. It is a sovereign nation within the United States and it was declared a national historic landmark in 1965. The multi-story adobe dwellings still have people living in them today. About 150 people live in them full-time, while others who own the buildings in the Pueblo live in homes closer to their fields or in more modern houses. Two structures—Hlauuma (north building) and Hlaukwima (south building)—are considered the oldest continuously inhabited communities in the United States. In all, there are more than 1,900 Taos Indians living on Taos Pueblo lands. The Pueblo is open daily, except when there are tribal rituals and for about ten weeks in late winter and early spring. Visitors are welcome to tour La Hacienda de los Martinez. You will find it much as it was in 1826, when Padre Antonio Jose Martinez began serving the parish and started the first newspaper west of the Mississippi. An offshoot of that newspaper is still published today. In the Hacienda’s period rooms, you will be transported back to life 200 years ago. Art has long been a vital part of this area, since the time Indians made carvings to the present. In 1898, two artists—Bert Phillips and Ernest Blumenschein—stopped in the area to have a wagon wheel fixed. They found it was such a fascinating area that they decided to stay. Since then, artists have migrated to the area. Museums display many fascinating pieces of their work. The Harwood Museum of Art is where you will see the works of some of Taos best-known artists of the past and present. The building was purchased by Burt and Elizabeth Harwood in 1916 and remodeled into a showplace for local artists, as well as historic 19th and 20th century Hispanic art. There are several other museums to visit (www.taosmuseums.org). You can purchase one ticket at any museum and use at all five. There are 80 art galleries in the area, plus murals on downtown buildings which depict Taos history. Don Fernando de Taos Plaza is the heart of the Taos area. Spanish colonists built it more than 300 years ago. Today, the plaza is still the center of activity where you will find stores and shops that sell authentic native jewelry, weavings, pottery, drums, paintings and sculptures. You will find old mercantile stores with galleries, shops and restaurants and more along Kit Carson Road, and Bent and Ledoux Roads. Outdoor activities are varied. Mountain bikers will love the 27-mile South Boundary Trail. Take horseback journeys throughout the area. Maybe you and the family would enjoy llama tracking. Follow the West Rim Trail along nine miles of the scenic Rio Grand River. One of your side trips can be to see the Rio Grande Gorge Bridge. It’s eight miles northwest of Taos, spans 650 feet above the river and offers enchanting views. You might enjoy boating, either gently floating down the Pilar Race course, or if you are more adventurous, shooting the class IV rapids. To challenge your golfing skills, there are two 18-hole champion-rated courses. Play a round in the sage brush at the Taos Country Club or at Angel Fire located high in the hills. Don’t feel up to walking 18 holes at this altitude? Then try the 9-hole El Valle Escondido course. Of course, hiking over the trails opens up surprising beauty with every step. If you plan your visit when the snow melts, plan to do some fly-fishing for rainbow trout as the small streams fill with cool, clear water. And speaking of snow, take your choice of downhill or cross country skiing or snowboarding. At an altitude of more than 8,000 feet, with an arid climate and so many days of sunshine, the snow is soft and dry. There are many excellent resorts, some offering spas and messages to ease the weary muscles after a day on the slopes. Taos is the center of a vast area, with beauty and history everywhere you look. It was known as the capital of the fur trade business in the Southwest when trapper and guide Kit Carson settled there. Visit his home, which is now a museum. Within walking distance from the Plaza is a 25-acre plot known as the Kit Carson Cemetery where his grave is located, as well as that of Padre Martinez. Also nearby is the Kit Carson National Forrest which covers 1.5 million acres. Its altitudes range from 6,000 feet to Wheeler Peak at 13,161 feet, which is the highest peak in New Mexico. Many small villages surround Taos and each has its own unique style and attraction. If you are an artist, bring along your supplies or purchase them at one of the local stores. Your biggest problem will be what to draw or paint first. Not artistic? Then bring along at least one camera. You’ll capture memories to last a lifetime. The Taos airport is just eight miles out of town. 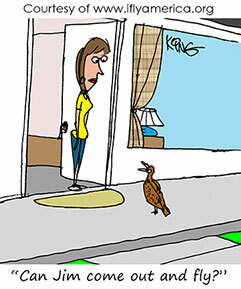 It has one runway—4/22—is asphalt 5,803 by 75. Rental cars are available. Remember, the altitude at the Taos Regional Airport is 7,095 feet MSL where the air is thinner. So brush up on high altitude takeoffs. With such a variety of accommodations, reserve what’s right for you at the location you prefer. You can also book your accommodations and rental car through IFA’s Online Travel Booking Service. Deep discounts may apply.